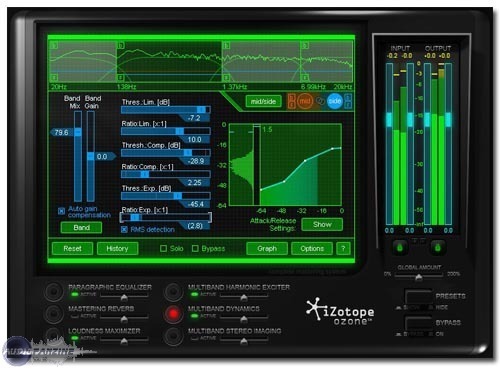 IZotope has announced it is shipping Ozone 4 on January 30th. iZotope has updated and expanded Ozone's processing algorithms, optimizing them for today's low-latency DAW environments. Ozone 4 features a new Intelligent Loudness Maximizer mode, mid/side processing for superior control over the sound stage, hybrid crossovers, a re-designed interface and an updated preset manager featuring innovative MacroPresets. Refined EQ controls, automatic gain compensation, “Amount” sliders to dial in more or less processing on each module, and more. Ozone 4 will be available for $249 MSRP. Ozone 4 is distributed worldwide by M-Audio, and will also be available direct (download only) from izotope.com. Customers who bought Ozone 3 after October 1, 2008 are eligible for a free upgrade to Ozone 4 when it is released. Existing Ozone 3 customers will be able to upgrade for only $79 USD. [NAMM] POD Farm Free w/ TonePort UX8 Line 6, Inc. offers POD Farm™ Platinum plug-in as a free download to all past, present and future owners of TonePort® UX8, the rack-mountable USB 2.0 audio interface. [NAMM] Line 6 POD Studio KB37 Line 6, Inc. announces POD Studio KB37, a USB audio interface that combines a 37-key MIDI controller and multiple inputs and outputs with a collection of pro audio software that includes POD Farm. [NAMM] NI Guitar Rig Mobile Native Instruments today announced Guitar Rig Mobile, which is designed to turn a computer into a guitar recording and performance setup.